It’s clear why Larry McKay counts on Sennebogen to meet his obligation to L-P. Photo courtesy Sennebogen. Insiders recognize that Larry McKay is a rare species in the lumber processing industry. 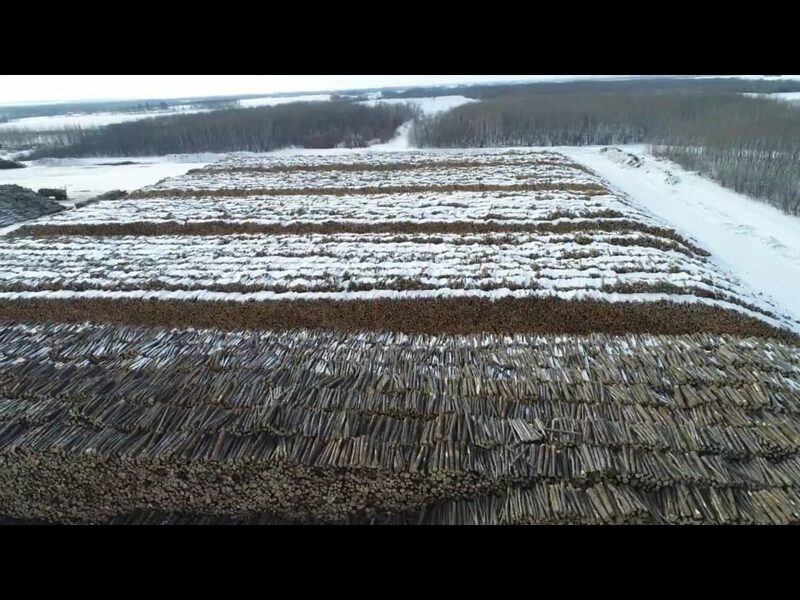 Mountainside Unloading opened for business in 2006, across the road from L-P’s OSB mill, 300 miles (500 kilometres) northwest of Winnipeg. At that time, McKay took over the yard from the original owners who founded it. L-P has diversified Swan River’s product range since then, including OSB. Today the mill is processing approximately a million board feet of finished product per day! Those original two machines were equipped with a Sennebogen K14 boom, giving the 830 a reach of 45 feet (13.7 metres), compared to the 35-foot (10.7 metres) reach of the older loaders. Building stacks up to 25 feet (8 metres) high, McKay’s operators are usually working at eye-level with their stacks. In fact, it was the height of the 830’s elevating cabs that, at first, made them wary of riding in it! Soon, though, they found that extra cab height made stacking a much simpler and safer process. The square footprint of the 830 also gives operators a stable 360º lift radius, allowing them to work efficiently between tight rows with minimal maneuvering. Over the next two years, McKay added two more of the same machines to his fleet, matching up his equipment with his 12-man crew rotation. At least two 830s are running day and night, with three often running when truck traffic is busy through the winter months. The crews work 12-hour shifts with a pair of operators alternating days and nights on each machine, four days on and four off. When they finish their shift block, the machines come in for cleaning and service, while the other two units go out for the next four-day cycle. 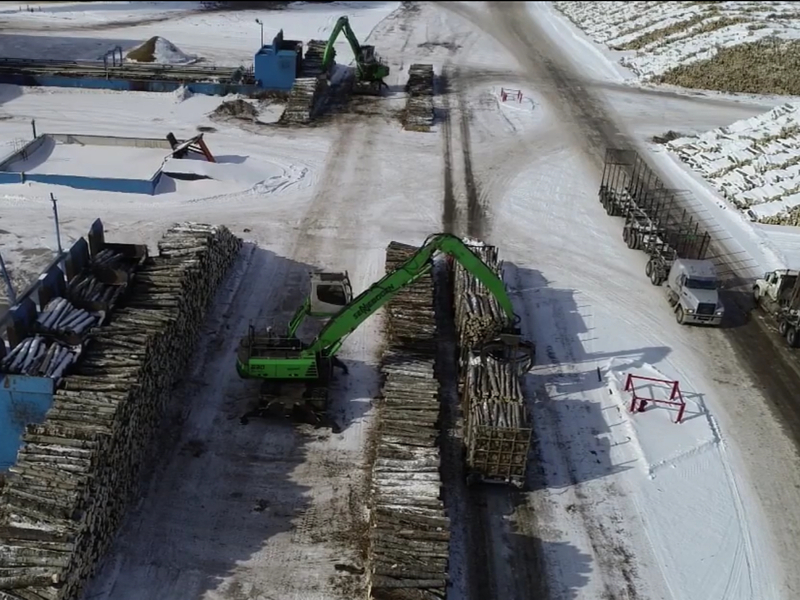 Typically, the yard handles 160 trucks of poplar wood per day, with about 50 truckloads going straight to the mill while the rest is stockpiled in the yard. The reach and visibility on the 830 allows the operators to reach across and load the trucks. Photo courtesy Sennebogen. Reflecting on the change in loader technology, McKay notes how, 10 years ago, he had two-wheel-drive Prentice machines pulling 50,000 lb. trailer loads. With the new 830s, the yard now has four-wheel-drive machines with dual transmissions capable of pulling 100,000 loads through six inches of wet clay, day in and day out. Last year, McKay added a fifth 830, this one fitted with the longer K19 boom that provides additional 10 feet (3 metres) of reach for high stacking. The objective is to build up the stacks before the roads are restricted by summer rains and mud. He is shooting for 240,000 m3 stocked to be in the yard by spring. While this unit is dedicated to stacking duties, its real purpose is to reduce operating hours for the fleet. “With this rotation, we can keep these Sennebogen going forever. They’re a well-built machine, and I’m lucky to have some very smart fellows here to maintain our equipment,” said McKay. The reliability of Mountainside Unloading’s service is what earned the firm its special place in the Louisiana-Pacific supply chain. With his five Sennebogen machines, McKay has the capacity he needs to meet the requirements of a very productive mill, plus the flexibility to maintain a thorough service discipline that will deliver long life and reliable uptime without fail.